In 1950s Japan, the creams and lotions available for women to use on their complexions were thick, greasy and apt to clog the pores. After one woman had enough of using skin care products laden with petroleum, she approached her pharmacist and asked him if he could mix her an alternative. Inspired by the woman's request, Yoshikiyo Nowatari went to work creating his own skin care formula based on glycerin rather than petroleum. The lightweight texture and effectiveness of the formula quickly made his product, Yu-Be skin cream, the best-selling facial cream in Japan. While the Yu-Be skin care collection has grown over the years to include a host of products for the complexion, the brand still uses Nowatari's guiding philosophies. All of the products are healthy for the complexion, enriched with vitamins and minerals. The formulas are comfortable for women to wear and designed not to clog the pores or cause hypersensitivity reactions. The products have been rigorously tested, even in extreme settings like on the top of Mt. Everest and in Antarctica. Try Yu-Be products for your complexion! 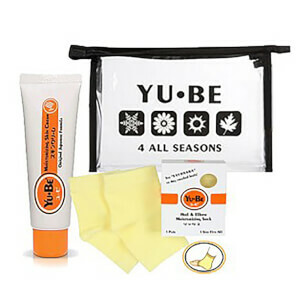 Launched by a Japanese pharmacist in 1957, Yu-Be uses a glycerin-based formula to tackle dry skin. Yoshikiyo Nowatari developed this line of products after hearing women's complaints about dry, cracked skin. Seeing that petroleum-based moisturizers were causing problems for many women, Nowatari devised a different formula, one that became a highly sought after product in Japan. In fact, Yu-Be is one of the longest-selling skin care products on the market in Japan, and it is the top-selling medicated and vitamin-enriched cream in today's market. 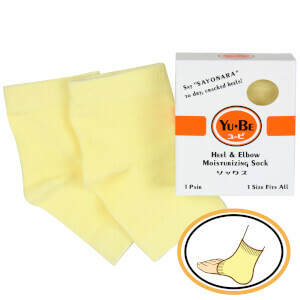 In their more than half century of production, Yu-Be products have been embraced as a solution for a variety of types of dry skin, from cracked heels to diaper rash and frostbite. Whether you are dealing with one of these conditions or simply want to nourish your dry complexion, Yu-Be products can work for you. Hydrating your skin from head to toe, focusing on your complexion and nourishing your lips are all possible thanks to Yu-Be products. This brand has been celebrated in such national publications as Allure, Elle, InStyle, and The Wall Street Journal. Dry skin is a common condition no matter your skin type. Whether your skin's moisture is zapped by cold, dry air or aging or if you're predisposed to having dry skin, there's help. Yu-Be products offer rich nourishment for even the driest skin types. If other moisturizers and lotions have let you down, give Yu-Be a try. The company's glycerin-based formula is unique and proven, thanks to the company's decades of success in both the Japanese and international marketplace. When the Japanese pharmacist Yoshikiyo Nowatari was asked to create a soothing lip moisturizer in 1957, the result was what was to become the first in the line of Yu-Be Products. Until then, only petroleum-based skin care products were available in Japan; by choosing to formulate his medicated treatments on a glycerin base, and by adding vitamin E, vitamin B2 and camphor as medicating ingredients, Mr. Nowatari was able to offer an effective skin care alternative to his customers who were suffering from dry, chapped skin. The formulated ingredients in Yu-Be Products help moisturize the skin and allow it to retain proper hydration levels, smooth rough areas, heal damaged skin, soothe irritation, improve skin elasticity and provide antioxidants for long-term protection. The glycerin base is quickly absorbed into the skin, delivering the healing ingredients deep into the tissues. Over time, the number of Yu-Be Products has increased to include skin creams and lotions, and has become one of the most popular lines of lip and skin care treatments in Japan. Now available in throughout the world, they continue to offer year-round skin care. From its humble origins, the lip and skin care line of Yu-Be Products has been a popular choice in Japan for over 50 years. Now available throughout the world, these treatments soften, heal and protect, without fragrances or artificial coloring. First to be introduced in this line, YuBe Lip Therapy continues to be very popular because of its effective moisturizing, healing and smoothing benefits. In addition to the protection offered by natural beeswax, this lip conditioner also includes deeply moisturizing sweet almond oil, shea butter, coconut oil and Aloe barbadensis leaf extract. The rosemary extract provides antioxidant protection and helps to keep the lips rosy red. Sun, wind and temperature extremes can quickly dry out and cause chapping on exposed skin. Enriched, non-greasy YuBe Moisturizing Skin Cream Jar helps to quickly restore moisture and smoothness to the face and hands, and helps heal split cuticles. Try it on other rough, dry skin, such as elbows, knees and feet as well. For a perfect all-over treatment for dry skin, YuBe Moisturizing Body Lotion soothes and smooths. Provided in a handy pump bottle, this lotion provides delightful relief for skin suffering from the irritation caused by the extra-dry air of winter, wind burn year round and sunburned skin. Experience a refreshing cleansing and exfoliating bath or shower with YuBe Foaming Body Polish. Walnut shell powder and rice bran particles gently scrub and exfoliate the skin while bamboo stem extract (from Bambusa arundinacea), high in natural silica, not only exfoliates but is an excellent moisturizer.